Almost "local" to Americans, these are the Actinarians of that occur off the coast of Florida on down to the coast of Brazil. Unfortunately, only a couple of species (and 99% only one of these!) of Condylactis make it directly into pet-fish markets... a few others as occasional "contaminants" on live rock. This is a great pity, as the area offers several outstandingly beautiful and hardy Anemone species... some with breathtakingly gorgeous symbiotic fish and shrimp species. 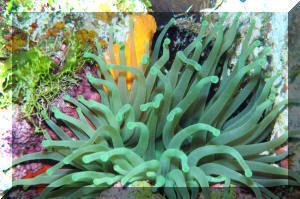 Actinoporus elegans, the Elegant Anemone. 7-9 inches in diameter. Distinctive knobbed tentacles or a flat oral disc. 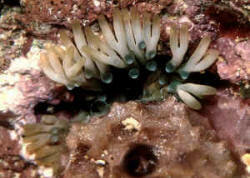 Uncommon, found in coral rubble and sand areas. 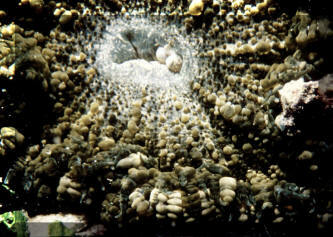 Symbionts include the Spotted Cleaner and Squat Anemone Shrimps, and Banded Clinging Crab. Alicia mirabilis, Berried Anemone. Usually clumped up by day, looking like a cauliflower somewhat; expanding usually only at night... here semi-opened, (and a close-up crop below) in Curacao 2015. Bartholomea annulata, (one of) the Corkscrew Anemone/s. 4-7 inches across. Has numerous long, thin, pointed tentacles that are transparent, with internal whitish corkscrew markings. Often found in discarded shells. Able to retract quickly. Red Snapping Shrimp and Pederson's Cleaning Shrimp are symbionts. Cozumel photograph. Bartholomea cf. lucida, the Knobby Anemone. 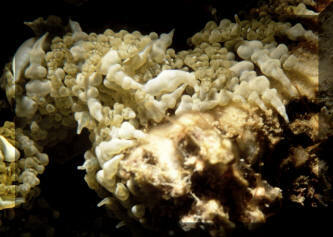 Similar to B. annulata, with translucent, tapering, thin tentacles, but smaller (up to 4 1/2" across) and having nematocyst-bearing knobs instead of corkscrew markings. 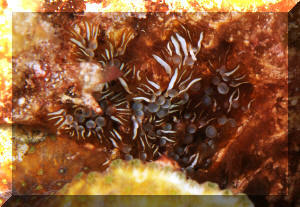 Close up at right and below: Bahamas photos of Knobby Anemones and Pederson's Cleaning Shrimp, Periclimenes pedersoni. Bahamas pic. And here's a C. gigantea with its commensal crab, the Banded Clinging Crab, Mithrax cinctimanus in residence. Cozumel pix. You may see/find the name Condylactis passiflora, the (Florida) Pink-Tipped Anemone. This is a junior synonym for C. gigantea. Epicystis crucifer, The Beaded Anemone. Have 200 or so tentacles that are short, tapering. Oral disc with small bead-like tuberculations emanating from the center. Reddish verrucae on basal disc. Aquarium and Cozumel photos. Lebrunia coralligens, the Hidden Anemone. Uncommon, hidden in cracks from which long pseudotentacles extend with roundish, differently colored tips. Brown to bluish in color. True tentacles are long, unbranched. DiF Roatan 2017. Below in the Bahamas. Toxic to the touch. Lebrunia neglecta (nee danae) (Duchassaing & Michelotti, 1860), the Branching Anemone. Has finger like and stubby, branching "pseudotentacles" (true, longer tentacles are usually only extended at night). Typically brownish to gray in color, a few bluish to green. Common in the tropical West Atlantic. Able to quickly withdraw into its closed space. Will easily sting other livestock, aquarists, divers exposed skin. Belize close-up, Cozumel and St. Thomas U.S.V.I. images. Stichodactyla helianthus, the Sun Anemone. With hundreds of small, thick tentacles it's easy to mistake this species as a Corallimorpharian. Sometimes very common in shallow back reefs. 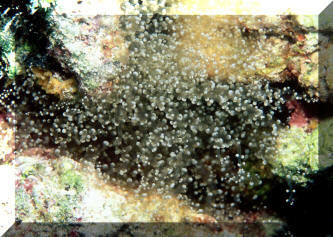 Symbionts include the Squat Anemone Shrimp and Banded Clinging Crab. A strong stinger! Belize and St. Thomas images. Viatrix globulifera, Turtle Grass Anemone. Tropical West Atlantic. 1/4-3/4" diameter. This one in the shallows off Playa los Glorias Hotel in Cozumel. Yes there are several other Actinarians that hail from the tropical West Atlantic. Most are small, obscure... found on Sponges, Turtle Grass, and/or rare. There's even a (pest) species of Glass Anemone (Aiptasia tagetes), sigh. None are regularly found/collected for the ornamental aquatics interest. For folks with a penchant for the rare, buying, culturing fresh live rock from the area can be a viable avenue for securing specimens. Kenney, William R. 1986. The Atlantic Frilled Anemone. FAMA 6/86. Straughan, Robert P.L. 1960. The Florida Sea Anemones. TFH 4/60.